(Reuters) - Apple Inc (AAPL.O) quarterly results smashed Wall Street expectations with record sales of big-screen iPhones in the holiday shopping season and a 70 percent rise in China sales, powering the company to the largest profit in corporate history. The company sold 74.5 million iPhones in its fiscal first quarter ended Dec. 27, while many analysts had expected fewer than 70 million. Revenue rose to $74.6 billion from $57.6 billion a year earlier. Profit of $18 billion was the biggest ever reported by a public company, worldwide, according to S&P analyst Howard Silverblatt. Apple's cash pile is now $178 billion, enough to buy IBM (IBM.N) or the equivalent to $556 for every American. Apple Chief Executive Officer Tim Cook said the Cupertino, California-based company would release its next product, the Apple Watch, in April. Shares rose about 5 percent to $114.90 in after-hours trade. Daniel Morgan, senior portfolio manager at Apple-shareholder Synovus Trust Company in Atlanta, Georgia, said that the report was a good sign in a quarter where big tech companies such as IBM and Microsoft Corp (MSFT.O) have disappointed. Apple Chief Financial Officer Luca Maestri told Reuters in an interview that the company did not sell more iPhones in China than the United States, despite some earlier predictions by research analysts. 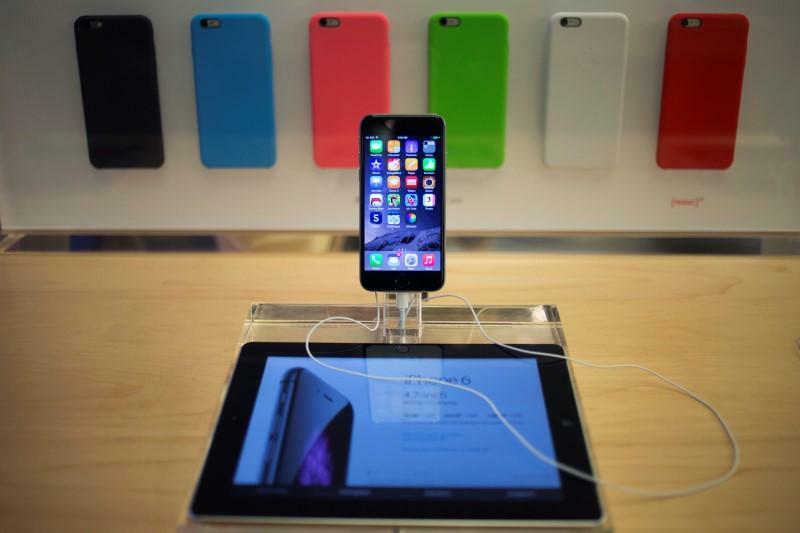 But the big-screen iPhone 6 and 6 plus drove revenues in China were up 70 percent in the quarter from a year earlier. The company's success in the competitive Chinese market can be attributed to its partnership with China Mobile Ltd <0941.HK>, the largest global mobile carrier, and the appeal of the larger screen size of the iPhone 6 and 6 Plus. Maestri said he does not expect Apple to struggle because of China's slipping economic growth. "We haven't seen a slowdown," he added. Maestri also said the company doubled iPhone sales in Singapore and Brazil. Apple will reach 40 company stores in greater China by mid-2016, Maestri told analysts on a conference call. Carolina Milanesi, an analyst with Kantar Worldpanel ComTech, also lauded a 14 percent rise in unit sales of Apple Macintosh computers and sales of older iPhone models. Apple was well positioned for the current quarter in China, she added, which will include the Chinese New Year holiday and reflect Apple's attempts to sell through new channels. Apple reported net profit of $18.02 billion, or $3.06 per diluted share, compared with $13.07 billion, or $2.07 per share, a year earlier. That topped expectations of $2.60 per share, according to Thomson Reuters I/B/E/S. Analysts had expected revenue of $67.69 billion. Maestri said that Apple faced "a clear headwind" from the strong dollar but that it had included the challenge in its forecasts. Apple predicted revenue of $52 billion to $55 billion in its fiscal second quarter, compared with Wall Street's average target of $53.79 billion. Cook said that the company's new mobile payment service, Apple Pay, which lets customer buy products from select merchants with their phones, was in its "first inning" and the company would consider adding new features as it looked at expanding outside the United States.